I wonder whether the website which I manage might be of help in the study of surname distribution? It is the website of the National Archive of Memorial Inscriptions, NAOMI for short. The address is: www.memorialinscriptions.org.uk. There are at present 29,263 people from 108 burial grounds named on the site . To read the inscriptions on their memorials searchers have to pay (£4), but searching is free of charge. If you enter first the county's name on the home page and the name you are interested in, pressing 'Search' will bring up a list of all the names at present included in the database from Bedfordshire, together with their first names, dates of death, age at death and the place of their burial. Then you can use the search facilities to help you find spelling variants of the names. The two most useful ways of doing this are by employing in your search box the signs? (question mark) and * (asterisk). The ? works like a wild card – it can represent any letter. So, for example, the surname ‘Grey' can be spelled 'Gray'. To search for both, enter 'Gr?y. The * works in a similar way, but it can bring up any number of letters. Try ‘Gr*y’.Other names are found in a wider variety of spellings. An example is 'Sewell'. The only common factor in the various versions is that they begin with an 'S' and end with an 'l'. Enter ‘S*l and you will get all the examples that are available which begin with ‘S’ and end with ‘l’. As you can see, this is a powerful tool from which a surname distribution map could be drawn, taking account of migration and of variant spellings. And Richard has supplied a photograph from NAOMI. 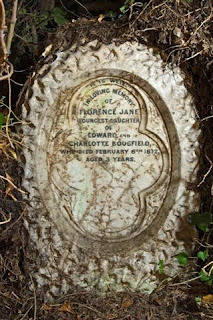 It is of the much loved and mourned daughter Florence Jane (known as Edris) of Edward and Charlotte Bousfield. Charlotte's diary was published by BHRS and has recently been reprinted in paperback at £14.95.